Some people 1, 2, 3 claim that High Frequency Trading is partly to blame for the extreme volatilities in the markets yesterday (24. August 2015). Is the amount HFTs move even enough to push the markets down like that? Does this behaviour align with the way they operate? How can you explain the low Dow Jones market open? Isn't it more likely that private investors just sell at market open? Why would HFTs even trade directly to market open when there is no arbitrage to make? Using months of proprietary data that labels participants by their participant ID, it has been found that during periods of significant volatility, the composition of HFT participants in the book remains mostly constant as a fraction of the total BBO composition. 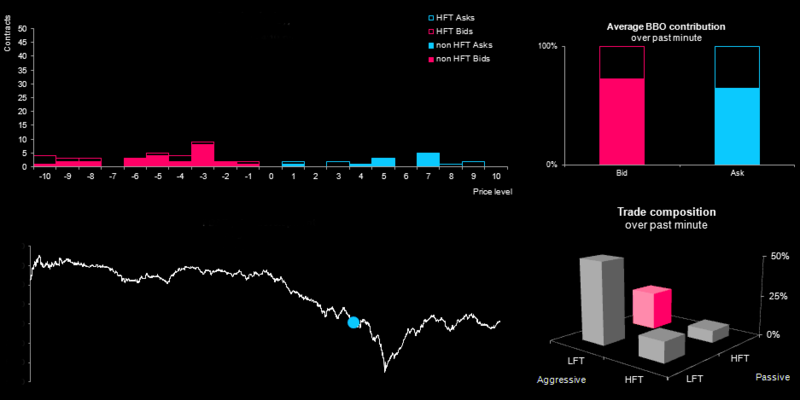 What really changes, it was found, was that the fraction of low-frequency traders aggressing on HFT market makers increases significantly during periods of high volatility. I can't say what other HFT operations do, but I can give you a description of how our automated systems worked and that may give some insight into what goes on. From 1999 to 2007 I ran an HFT and Arbitrage trading operation that focused on the US markets. In the early days we were mostly focused on arbitrage between the ECNs and major exchanges, but over time we evolved into a number of different strategies. These included automated liquidity rebate trading, micro movement trades based on order imbalances and a handful of specific arbitrage situations. Effectively, a large part of our trading was ultra short term market making with an added analytic edge. By the mid 2000's a typical day would include roughly $500 to $700 million in transactions. Our algos would look at level 3 data streaming to our colo facilities and use our models to identify specific opportunities as book imbalances occurred or spreads shifted. It is impossible to know for sure, but from close monitoring of the data it seemed like there were many other operations using similar concepts. We knew that our systems worked best within a range of normal conditions. Outside of "Normal" we were more likely to take losses than make profits. Based on our understanding of our trading we built a market monitoring system that triggered what we jokingly called our GTFO signal. I will leave you to guess what the acronym means, but I won't write it here. When GTFO was triggered we removed all our passive orders from the market and actively liquidated our open positions. This would normally cause a moderate loss for us but prevented much larger losses. Note - the positions we would liquidate were typically half long and half short, but depending on the situation there could be a resulting bullish bias due to adverse selection. The triggering situations were rare, but I can see how in some cases a portion of the HTF systems would step back from the market and cause a dip in liquidity. Our process was complete within a few seconds and we didn't resume trading until things stabilized or we felt comfortable getting back to work again. A few specific things to note, and understand I can only comment on what we did. We didn't have any systems that would chase the market down or exasperate the move. Honestly, it wasn't worth programming a strategy around situations that only happen once in a great while. The HFT reaction may contribute to a portion of a drop in liquidity at the beginning of an extreme market event, but from my point of view our participation didn't go past the first few seconds. I think there are many other systemic changes that have happened. Non-automated traders have access to a wide variety of tools they didn't have in the past. Stop loss and other triggered orders are extremely common now. Market information also flows very quickly. Everything is faster for everyone in the trading world, not just HFT systems. This is pure speculation, but in my mind it makes sense. An extreme market moving event can be caused by a wide variety of things, recently fat finger errors seem to be the most common. These errors cause a sudden reaction in market prices that cause some HFT systems to back away from the market. This can cause some liquidity to dry up. Simultaneously other types of automated systems, mostly Index/ETF component arbitrage systems or correlation arbitrage see this as an opportunity for profits or at the least a need to rebalance. The sudden price shift creates discrepancies between index components and the ETFs based on the indexes. These systems flood the market with aggressive orders to get filled. This eliminates the arbitrage but can cause a shock in the broader market. Pairs and Multiples trades also get distorted as normally correlated symbols get erratically pulled around. This first set of events moves the market disruption from one or two concentrated symbols where it began out to a wider number of stocks. As this happens risk parameters on many other systems are getting triggered. These can be anything from stop loss orders at a retail level to risk level triggers at hedge funds. No one has a clear idea of what is happening or why, but the market is suddenly going crazy. Time to bail out. The rest of the market is also becoming aware that something is going on. CNBC would be making remarks about the sudden crash and would be scrambling to get Nassim Taleb on the show. A portion of the investing/trading public will start to panic and also liquidate their shares. Day traders are either having a field day or crying into their keyboards. All of this is happening in a low liquidity environment. The market makers & specialists (those left) will be backing off the market to their outer limits as quickly as possible. Everyone will be focused on getting out. The market will drop fast. In the old days, many similar things would happen when market shocks occurred, but the market functioned at a much slower pace. This gave the broad market a bit longer to absorb the news before everyone's orders hit. Some participants would see the situation as a buying opportunity. There would be a bit more balance to the process. Today every reaction is concentrated into such a small amount of time there is literally no way to understand what is going on as one of these events unfolds. The only rational choice in an extreme situation where you are uninformed is to limit risks by liquidating. HFT systems are part of the markets now, but I honestly don't see them as the cause of these events any more than the other participants. As technology speeds up trading, we are going to see more of these events. For the people who want to demonize the HFT traders and make rules to push them out, be careful of what you wish for. The majority of HFT trading is providing the liquidity that Market Makers and Specialists used to be responsible for. If HFT gets kicked out there will be a big hole in the bid/ask spreads. Without the additional market volume those cheap commissions could also go away quickly. Losing the automated trades would be a huge mess for the markets. By design, market makers do not exacerbate volatility because their trades are, as a whole, net passive. Not the answer you're looking for? Browse other questions tagged volatility high-frequency market-making or ask your own question.